Tango Bar has made an impact on the Sydney Tango scene with their energetic style of playing, exploring the original roots of tango - the sounds and flavours of a passionate music that has forever moved audiences around the world. Featuring Raul Techera on bandoneon, Tango Bar specialises in the authentic sound and rhythm of tango, delighting tango dancers . 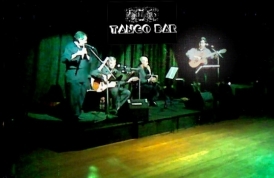 All members of Tango Bar are originally from the land of tango and milonga, the "Rio de la Plata", Buenos Aires and Montevideo.